These Crooked Playing Cards are just like regular playing cards, except each card is kinked! 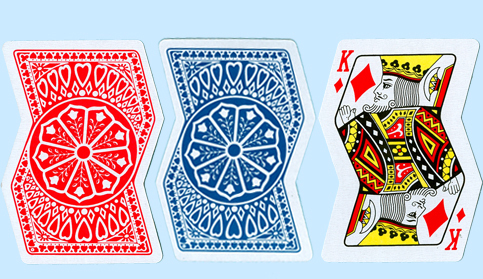 The Crooked Playing cards feature a bent, yet ergonomic shape and BLUE backs. Blue Crooked Playing Card Decks are great for parties, as a gag, or just for something different. Our Crooked Decks are sure to get attention at your next party or Card Game. For additional information or wholesale pricing on Blue Crooked Decks, please contact us at 1-800-233-0828.